Ringo Starr on New Album 'Give More Love' & Running His Emoji-Filled Twitter. Beatles Radio: The Beatles, Solos, Covers, Birthdays, News The Fab 4 and More! Ringo Starr has just turned 77. It's a few days after his celebrity-packed “Peace and Love”-themed birthday bash at Capitol Records in L.A., and he’s holding forth inside a Beverly Hills hotel on a warm summer afternoon. Among other things, about how he almost ended up decamping to Nashville last year with his pal and former Eurythmics guitarist Dave Stewart to make a country album. And about living in Los Angeles, where he first bought a house back in 1976 (“I love America,” he tells Billboard, “but I love L.A.”). He's even talking about those long strings of emojis he tacks on to the ends of his tweets -- which, by the way, he posts himself. At some point during the conversation, you find yourself wondering whether it’ll always be like this. That one of the most famous drummers in rock music will remain the act you’ve known for all these years and keep this up well into his eighth decade. And why shouldn't he? 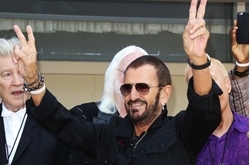 Ringo Starr may get old, but as far as he's concerned, being Ringo never does. Take, for example, asking him about his songwriting process, the first tentative fruits of which materialized toward the end of The Beatles’ run, when John Lennon and Paul McCartney had already taken their craft to stratospheric musical heights. On his 19th solo album Give More Love, set for a Sept. 15 release, the drummer doesn't pretend to be anything but the reliably uncomplicated showman he’s been since he first started working with his own material. And how does a drummer write a song, anyway?